MALOUF’s luxurious bedding, including their innovative Z Pillow, is a game changer. Plus, it’s pricepoint friendly. You can't put a price on a good night of sleep, which is why putting thought into your bedding is vital. Thankfully, there are companies like MALOUF that help make it easier to achieve luxurious and surprisingly affordable pillows, linens, and other nighttime accoutrements. While at the Summer Las Vegas Market, House Tipster trade show host and President of Arch-Interiors Design Group, Christopher Grubb, spoke with Jason Cale, Sales Manager at MALOUF. Jason was eager to talk about his company's latest products, including their state-of-the-art pillow technologies, as well as MALOUF’s charitable inclinations, which are sure to tug on your heartstrings. The first item from MALOUF’s innovative lineup that struck the eye of Christopher and the rest of the House Tipster media team was the Z Pillow, which features unparalleled technologies and many natural materials. Right away, the subtle scent of the pillow catches your attention. “It’s infused with essential oils,” Jason explained. “When you go to sleep, you’re calmed and soothed with the scent of lavender.” Of course, if lavender doesn’t tickle your fancy, you could also choose from other scents including chamomile and peppermint. Although the pillows smell like heaven, that isn’t even the start of what you get from a Z Pillow. Options are vast, to put it mildly. MALOUF manufactures a multitude of styles depending on the user’s sleeping preferences and where it’ll be used. For example, there are Z pillows specific for side-sleepers, traveling, and even contoured body pillows. 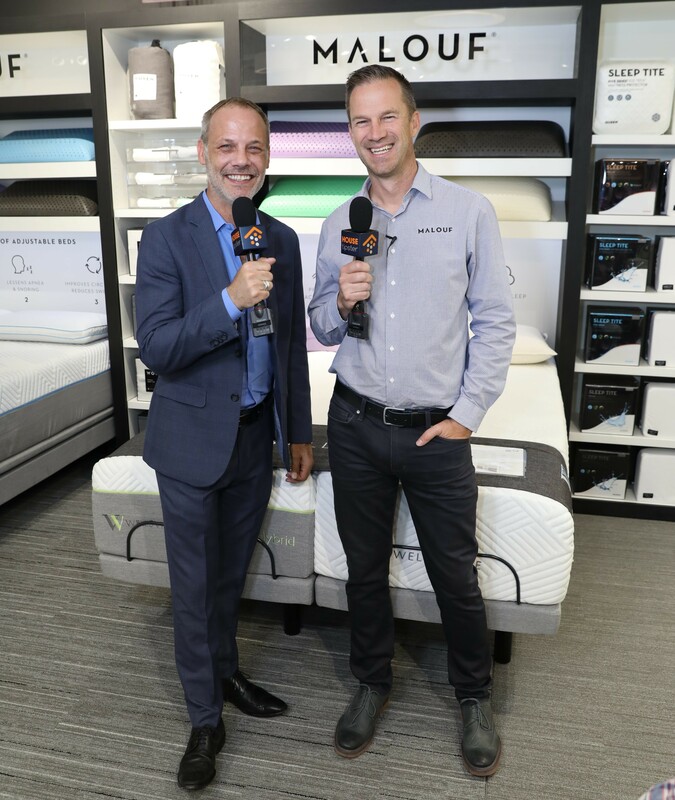 Christopher, who’s a big proponent of merging design and wellness, couldn’t help but gush over MALOUF’s focus on products that promote sleep and comfort. “You’re the only company that makes a triple down pillow!” he emphasized, and asked Jason to elaborate on this. “Our research and development team worked on this, and ultimately, we made the top part [of the pillow] 90% down and 10% feather, while the center core is 90% feather and 10% down,” Jason explained. This configuration supports the head and neck, starting at the core, while maintaining it’s comfortable feel. Aside from pillows, MALOUF is also known for their woven sheets, which are available in many eco-friendly (and remarkably comfortable) materials like bamboo and Tencel. Their Sleep Tite Protectors for mattresses and Isolus Topper are also standouts. “Our foundation is one of the most important things to us,” Jason explained. With Malouf, the products speak for themselves. They’re designed based on ample research, made with fine, green materials, and backed by a company that puts their philanthropic efforts at the forefront. We’re thrilled to have had the opportunity to learn more about MALOUF through this conversation, and we’re excited to see what’s next from this emerging company. You can learn more about Malouf here. Thank you, Jason and Christopher, for the opportunity to learn more about MALOUF!